Its more than 2 months, this post was in draft format. Unfortunately I completely forgot to finish this post. Today I received a request from a subscriber of our’s for a mutton curry, and then only I remembered about it. Wash the mutton pieces well and cut it into small pieces. Wash again under running water. Marinate the mutton pieces with chilli powder, turmeric powder, coriander powder, meat masala, salt and keep it aside for 30 minutes. Heat a pan / cheenachatti and add oil. Add onions (large & small) and saute it till it becomes golden brown. When onions turn golden brown, add ginger, green chillies, garlic and saute it well. Add tomato pieces and curry leaves and stir well to get it mixed well. Lower the flame and saute it. Add the marinated mutton pieces to pan (Add 1/2 a cup of water only if you need to be as a curry). Mix well and keep it in low flame for 5-8 minutes stirring it in between. Transfer it to a pressure cooker and cook up to 3 whistles. You can apply some seasoning with curry leaves and oil if you wish. Transfer to a serving bowl and serve hot with Appam / Pathiri / Idiyappam etc. You can also try more mutton recipes from our collection. This entry was added on February 23rd, 2014 by Cini P Moideen in Non Veg and tagged with tasty mutton curry, easy mutton curry, kerala mutton curry, mutton kulambu, spicy mutton curry, mutton curry recipe, mutton, how to make mutton curry. Last revised on March 26th, 2018. My wife , SANGEETA (keralite born and bought up in Orissa) read this and cooked it nicely. It was tasty. She even transfered the detail over phone to her friend there at Cuttack in Orissa. Thanks a lot for your wonderful feedback 🙂 This made my day. Good to hear that it came out well for you. Its a blessing for food bloggers, to have such encouraging subscribers like you. Thanks again for taking time to leave a comment here. you hav’nt mentioned anything about shallots and pepper …. listed in the ingridients list …. shall i replace with onion and pepper powder respectively..
Hi Surendran, I edited the post accordingly. Hope the confusion may had cleared. We tried the recipe and came good.but can u please edit on the first step about onion. U asked 25 small onions and 2 big onions.bu-t didn’t mentioned whether to chop the small onions and didn’t say whether to sauté both of them together.being an amateur it put lot of confusion in mind. Hi Indern, Glad you enjoyed the recipe and it came out well for you. I am also a beginner in food blogging 😉 Apologies for the confusion caused. Edited the post as needed. Thank you Megha for trying the recipe and for dropping the comments. Glad to know it came out well for you! Thank you Alex fro trying the recipe and your encouraging comments. Glad to know it came out well for you.. Stay connected! @Dr.Naseema: Thanks for your lovely comments! Meat Masala is a generic term. It will be helpful if the specific ingredients that make up the Meat Masala are indicated. 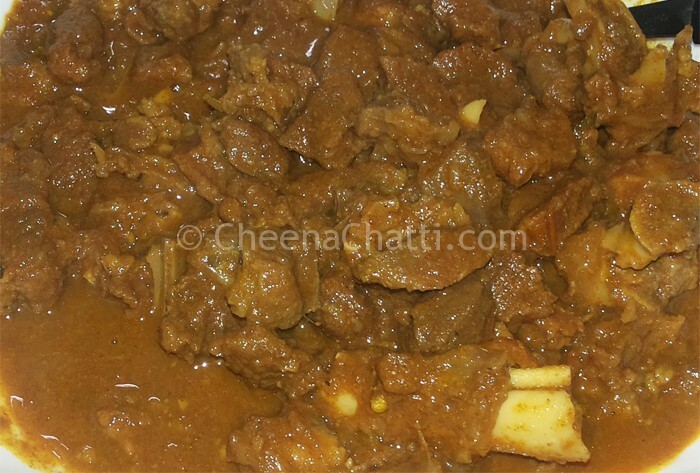 Hi Jacob, you can read about how to prepare meat masala at home from our recent post. Shallots are there in the ingredients and not in the preparation. When to add it? Hi Jithesh, both shallots and big onions are added together. 1/2 cup giner and garlic?